It is time to resurrect a little blog series I used to do. It was sort of an occasional "commercial break" between my musings and life happenings. I am a huge advocate and believer in simple pleasures. Life hits most people in stages that pass in a matter of years -- as you become a parent, you eventually get to sleep through the night again, you will put away the crib one day, you stop pouring your money into diapers and your child becomes one that can manage themselves and their needs within a handful of years. Challenging periods pass. Times and seasons they call it. Well, I call myself "California". I have one season. I will never sleep through the night, I will never be able to put away the crib (I use that word loosely, it is a resembles more of a high-walled WWF ring) and, after doing the diaper thing straight for 12 years, I will give my optimistic hope and say that I think I may possibly only have to be changing diapers for at least another decade. Essential to me are those simple pleasures I come across in my life. Those precious finds provide the same benefit as the grand pleasures others get to live out. As a special mom, my time and money are critically valuable commodities, and I only spend them on the most fabulous simple pleasures - which I will share with you periodically. My computer guru friend tacked on some analytics of sorts to my blog, which I probably am profoundly underutilizing, but it does report to me that my average number of reads per blog post is now hitting just over a thousand. I was shocked to hit over three thousand for a couple posts! Alan thinks I should advertise and make a little money off this. *gasp* Make money off my little journal of my secret thoughts that I open to the world? No way! These little promotions are coming to you without any sponsorship - just girlfriend to girlfriend. The latest ultra fabulous simple pleasure. . .
Sadie thought it was a bra when she saw it. (um, I nursed 5 babies. nope.) 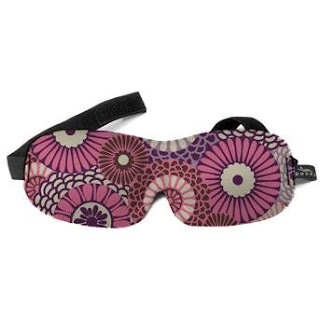 It is the Blinky Sleep Mask. Love LOVE. We have three large windows in our bedroom. I love the open view of meadows and forest from them. I love the light they let in, especially in winter when I need all the light I can get. For those reasons, I have only covered them with light filtering shades that I can draw closed. In the summer months, those shades do just that. Filter. Barely. So at 6am - or even earlier - my room is aglow in beautiful sunlight. Which is not so beautiful if I was going to be able to sleep until 6:30 that day, or perhaps even to a miraculous 7! I cannot sleep through the morning sunlight pouring in my room. I suffocate myself as I cover my face with my covers or put a pillow over my face. It finds me regardless. Enter that amazing little find. It has contoured eye pockets so my lashes and lids can move, it is soft as can be in silky neoprene and I don't even feel it. Today, I slept until my alarm at 7:20! The greatest Simple Pleasure of my summer. ahhh. And while I am on the topic of Favorite Things. Can I add her to the list? This feisty, tenacious, bundle of determination, will power and love to melt you is right at the top of my list of favorites. She just turned 4. Which, is my favorite age. I can not wait to see what the next year has in store. She has marveled us with her ability to perfectly maneuver a manual wheelchair before she could even walk, she can make her own breakfast on Saturday morning - scaling the fridge and pantry shelves and countertop to reach the cabinets to access all of the necessary cereal makings, she asks questions and has the analytical power and vocabulary of a 12 year old, she knows how to perform enteral feeds, she has the sleek prowess of a Cheetah yet can only speak in the volume range of 120-130 decibels. There is nothing simple about her, but she is one of my Favorite Things. And Minnie Mouse and Barbie are currently her favorite things. And to find a Minnie Mouse Barbie -- well that's just having your cake and eating it too. And speaking of cake. . . mmmm. Happy Birthday little Eliza Caroline! You are my favorite thing!